Take full advantage of The New School for Social Research’s location in one of the world’s hubs of scholarship and culture. New York City offers a dazzling array of academic resources, including universities, scholars, cultural institutions, libraries, non-governmental organizations, and the United Nations, as well as vibrant public and private sectors that offer research and employment opportunities. As a student, you’ll also receive discounts to some of New York’s premier cultural institutions like the Museum of Modern Art, Metropolitan Museum of Art, and others. Beyond earning a degree, living in New York City will enrich your academic experience, allowing you to cross paths with prominent scholars, visitors, guest speakers, and the thinkers and doers who make New York City a global cultural and intellectual center. See what happens when the boundaries of the classroom dissolve around you and the city becomes your classroom, library, and research center. 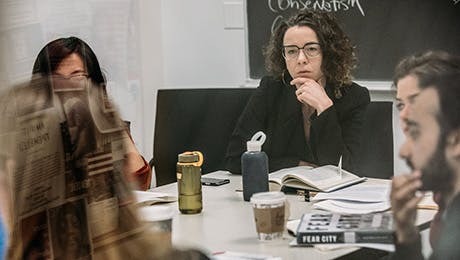 As a doctoral student, you will also have the opportunity to take specialized courses at universities around the city through the Inter-University Doctoral Consortium (IUDC) program. The door are open to courses and scholars at Columbia University’s Graduate School of Arts and Sciences and Teachers College; CUNY, The Graduate Center; Fordham University, Graduate School of Arts and Sciences; New York University, Graduate School of Arts and Sciences; Princeton University; Rutgers University, Graduate School–New Brunswick; and Stony Brook University, Graduate School.